Social benefit schemes are a very visible aspect of governance. However, delivering social benefits to 1.3 billion people in a country like India where financial inclusion is inadequate and multiple identity proofs are common, is an uphill task. For providing the benefits of any scheme to the citizens, the government needs to identify beneficiaries and maintain a database of eligible individuals. That said, beneficiary databases have been prone to bogus entries. The accuracy and legitimacy of the beneficiary databases has been hampered by the administrative and political discretion involved in granting identity proofs that fail to establish a unique identity of a beneficiary. Multiple identifications, such as BPL cards, driving licenses and voter IDs, continue to prevail. 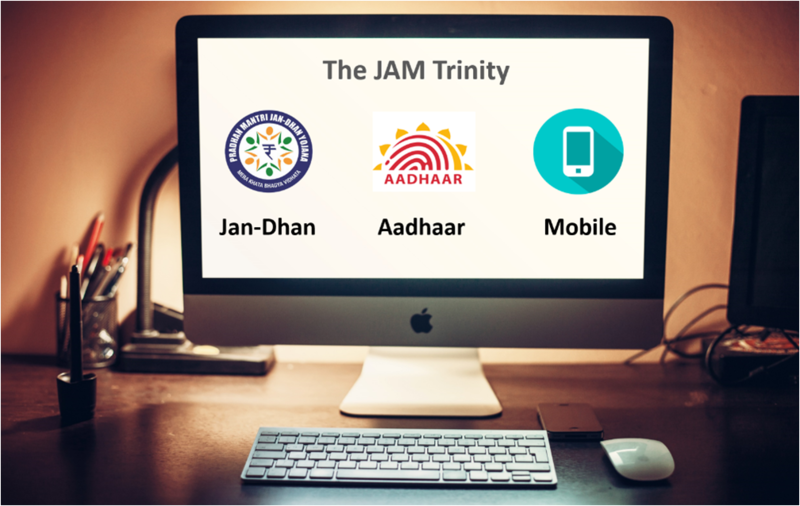 Now, the trinity of Jan-Dhan, Aadhaar and Mobile (JAM) not only promises to address the problem of multiple identities but can also help the country achieve its financial inclusion goals. As we know, In India, there are more than 4,00,000 villages with populations less than 2,000. Many of the people residing in these villages have long been unbanked because there were no banks serving their villages. To avail banking services, one had to travel to the nearby town or city. Let’s discuss the benefits that the JAM trinity has the potential to deliver. The Prime Minister Jan-Dhan Yojna (PMJDY) aims to provide a ubiquitous access to banking services with at least one basic banking account for each household. Other financial aspects have been added to these accounts, such as access to credit through Rupay debit card, insurance, and pension facility. In a span of about two years, more than 23 crore Jan-Dhan banking accounts have been opened and a sum of more than Rs 41,000 crore has been deposited into these accounts. PMJDY leverages the alternative institutional arrangement of the banking correspondents who cater to the needs of unbanked population that mostly resides in villages having population less than 2,000. The Jan-Dhan scheme offers a more holistic financial solution to this recently banked population than just being a savings bank account. Aadhaar being a unique identifier, helps in the de-duplication of databases by connecting each beneficiary with a unique Aadhaar Number. An Aadhaar seeding into various databases also helps in cleansing the databases and enables the government in more accurately weeding out the ineligible people from the databases. One such mammoth database cleansing initiative has been taken up by the state of Karnataka and is known as Karnataka Resident Database Hub (KRDH). With KRDH, the government has identified some well-to-do people such as government officers getting listed in databases such as MNREGS and Below Poverty Line (BPL), even though they are not entitled to those benefits. A mobile number helps the government in establishing a connection with the citizens for providing the information to them and facilitating interactions. For instance, a message is sent to a public distribution system (PDS) beneficiary, informing her/him about the dispatch of the consignment of subsidized food grains to the designated fair price shop (FPS). When the citizen visits the shop to claim the entitlements, the FPS can no longer deny receiving the consignment (as used to be the case earlier, when the consignment could often be diverted even before it reached the shop). Among other benefits of the mobile service, the citizens can book refills for their LPG cylinders using an interactive IVRS module. Prior to JAM, the Direct Benefit Transfer (DBT) scheme could be availed only by those who had access to the banking system. However, it was difficult to make DBT universal and mandatory in the absence of legitimate beneficiary databases and a financial mechanism that could promise bank accounts for all. DBT was launched in January 2013 and was designed to offer benefits of 28 schemes in 43 selected districts. The JAM trinity has given a boost to the DBT program, and expanded its coverage from partial to ubiquitous. Aadhaar has facilitated legitimate databases while Jan-Dhan has offered bank accounts for all. JAM has enabled remodeling of the LPG subsidy system through direct cash transfer instead of providing the subsidy amount to the Oil Marketing Companies (OMCs). The initiative is known as ‘Pahal’ and is probably the world’s largest DBT program. Yet, it accounts for only about 3.5% of the total annual flow of government subsidies. The total subsidies budget of the Union government and the state governments is about INR 750,000 crore (INR 7,500 billions) while the amount of LPG subsidy is about INR 20,000 crore (INR 200 billions). It opens avenues for further DBT reforms. Aadhaar establishes a unique identity for a citizen, and integrating it with the mobile number authenticates the identity by establishing a connection with the citizen. This convergence (of Aadhaar and mobile service) enables digital service delivery of the government while also enhancing the security of the transaction. Thus, DBT works in social benefits segment while authenticity works in digital government services segment. It is analogous to the DTH service, where the service provider uses a subscriber’s registered mobile number (RMN) for quick authentication and providing the service by interlinking the subscriber’s ID with the RMN. Another example is the use of mobile number for authentication by banking institutions for online cash transfers through one-time passwords (OTPs). To deliver good governance to India’s 1.3 billion citizens, the government is on a constant drive to find more innovate digital solutions. One such innovation is the DigiLocker platform that provides 1 GB free cloud storage to citizens for their important documents. Some documents can be issued to the citizens directly into their respective DigiLockers. It is intended to let citizens submit relevant documents through DigiLocker while availing a government service or processing an online application. The DigiLocker syncs with a citizen’s Aadhaar and mobile numbers to create a unique account for her or him. In what could be step toward using mobiles beyond OTP-based authentication, the Unique Identification Authority of India (UIDAI) is in talk with mobile phone manufacturers to develop Aadhaar-enabled phones. Such phones would help carry out biometric authentications when citizens are availing a government service online. This could even help citizens to avail those services that require higher levels of authentication or physical presence of the individual. In the long run, this could make it possible to do away with the in-person presence of an applicant even for applying a passport, and could also pave the way for online voting.